Hello! How's your half term going? I had so many plans and had hoped I would be able to squeeze in some blogging somewhere along the line but it just hasn't happened. As I usually say when we reach the half way mark, I'll be glad to get back to some sort of normality and routine! Instead, we've had a couple of play dates and I've been on somewhat of a much needed cleaning blitz. Anyone else just get that urge to get everything clean? Its a rare thing so I've been making the most of it and have even manage to de-clutter a few more things as I go. Win-win! On to this Twinkly Tuesday! 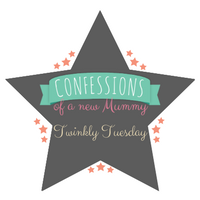 This week's Tuesday Twinkler is Mini-Human Resources with 12 things that being a parent has made me. No matter what anyone tells you, you just have no idea about any of it until you actually become a parent. You think you know what it is to be tired after a busy week of work but its a whole new level when you're doing it after nights of broken sleep. Then of course, there's the good old Mum - parent - guilt over any and everything. Fun times. Pop on over and don't forget to leave a comment! Thanks for your willingness to mother us by reminding!